John Chalmers Alexander, known as Jack, was born at Cobden on 28th December 1917 and apart from the war years, spent all his life in the arena. He was born to Peter and Ivy Alexander, Jack was the fifth born of seven children. Prior to enlisting in WWII he worked with the Rivers and Waters in the 1930’s laying the original pipeline form the Otway Ranges to Cobden reservoir. 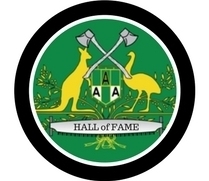 Jack Alexander life member of the Western Victorian Axemen’s Association. Jack’s love of woodchopping started very early. As a teenager after a long days work he would walk of cycle to a training session. On weekends he would work half a day and be off to a woodchop as soon as he finished. 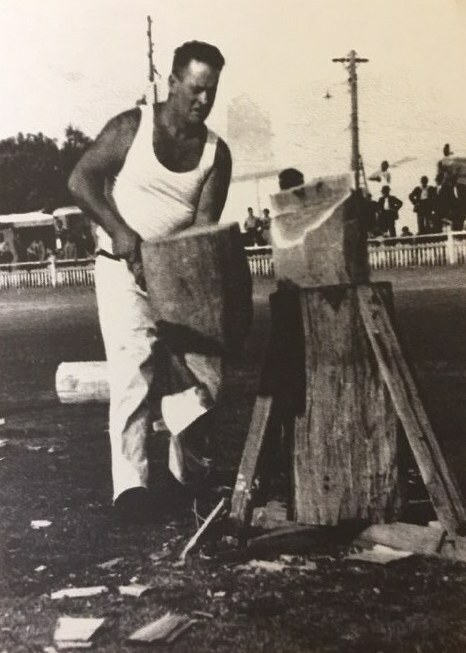 Jack was a good axeman and had quite a few successes around the carnivals. he competed at Melbourne, Sydney and Adelaide Royal Shows. One win he was particularly proud of was with his son, Stan, at the 1964 Bendigo Show in the father and son event. Reputed to have been the first cut of this event in Victoria. He best achievement was winning the South Australian Standing Block Championship at the 1947 Adelaide Show. For many years Jack was a log getter for various carnivals. This was no easy task as carnival were well attended those days and the job was done with an axe and crosscut saw. No chainsaws or loading equipment that we have today. As well as this Jack acted as a Ring Steward, setting up cradles, judging or whatever needed to be done. Jack was President and handicapper in the WVAA. He was awarded life membership of the WVAA in 1973. Health reasons forced Jack to give up competing in the 1980’s. This did not stop jack from being a ring steward at the Royal Melbourne S=how for 20 years. Jack died on the 4th April 1998, he was survived by wife Alma, daughters Linda and Carol and son Stan. Son Robert predeceased him in 1983.